Luminary, located in Finland, is a multiform high rise building with very strict tolerance demands. The challenges have to do with its complexity and the number of elevations, tall building methods, and the changing wishes of future residents. Success relates to model-based design and collaboration as well as sharing and utilizing model data on site. Luminary is the winner of the commercial category of Tekla Global BIM Awards 2018. The building mainly consists of precast concrete units, but the lowest floors are cast in place. The roof structures, monorails and exit stairs are all made of steel. 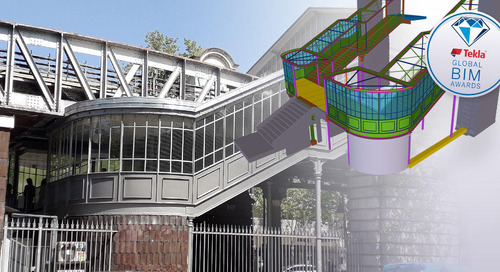 Facade maintenance has been carefully designed using the 3D model. A maintenance cradle on the roof circles the building on a monorail and its reach for window cleaning and facade trimming has been ensured using the model. A-Insinöörit Suunnittelu is carrying out the structural and building unit design of the project. They also delivered geotechnical design, including level design and acoustical design, such as studies of the audio-technical qualities of the stairways. Precast manufacturer Parma participated in model-based* cooperation. The IFC models and architectural DWG files from other design disciplines were used as references. 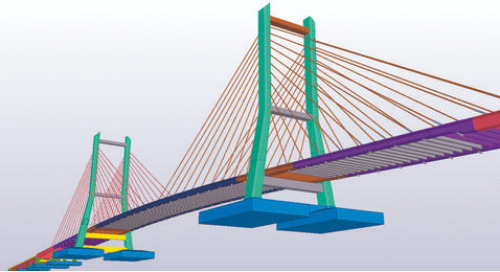 The Tekla model produced 3,070 drawings in total, of which 1,550 were for the precast units. 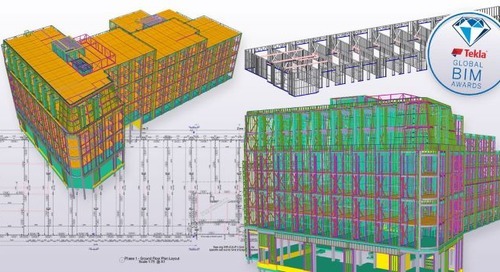 Including the Delta beams, hollow core slabs and floor slabs, the project consists of 2,580 units, and the Tekla model contains about 220,000 objects. Luminary is a challenging hybrid structure for designers, builders and fabricators alike. Its complexity and the number of elevations, tall building methods, and the needs of future residents have all had a hand in its planning. Because the plot will be filled to capacity, the supports and foundations have posed a challenge. Existing buildings on both sides, street elevations and other city infrastructure had to be taken into consideration in the design. The foundations feature various levels, and the complex cast-in-place sublevels are heavily reinforced including, equipment, penetrations and connections to municipal infrastructure. A special challenge was matching the two different frame solutions: the business section contains a beam-to-column frame, while the apartments include load-bearing internal walls. Regarding the CIP contractor, the casting areas were large with many complex shapes, and there was very little storage space on site. Strict tolerance requirements for tall buildings posed a challenge for precast manufacturing. The windows and doors were installed on the units at the factory, and the precast detailer modeled these parts using Tekla Structures in order to accurately manage the weights and centers of gravity. The design was more demanding than usual, partially because the wall elements include large openings and loads. However, it was possible to model all units in detail and produce the drawings directly from the model. The units’ electrical equipment was modeled based on the electrical designer’s IFC files. 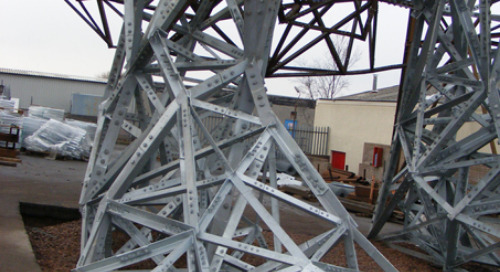 The temporary bracing and steel connections of thin-shell panels were modeled in exceptional detail. Additional joint parts, like welding plates, have also been modeled. The project was successful because of its very high quality and accurate model-based design, seamless collaboration and extensive on-site model use. The design team was able to work seamlessly together utilizing and producing high-quality, accurate models. 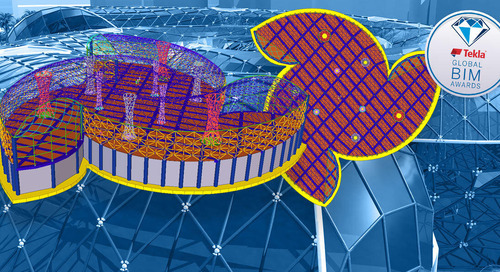 With the Tekla Model Sharing, the builders and the precast manufacturer were able to access the model in real time in a more accurate and visual form compared to a shared IFC model. 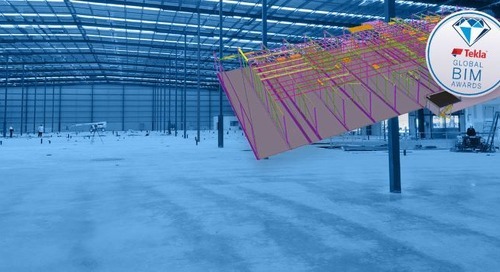 Among other benefits, accurate modeling made fully model-based construction layout possible for all prefabricated structures and precast producer to transfer data to their production management system directly from the structural model. Betonirakenne Oinas Oy, the concrete contractor worked model-based and utilized structural engineer’s models as a base for their work. The contractor used models all the way from estimation, pour planning, rebar detailing and documentation to the on-site work management. On-site, the model has been used in a versatile way by managers and employees alike – for example, to visually aid installations and carpentry, at the BIM kiosk. In this project, the positions on site were measured based on the structural model, a first which made work significantly easier and faster. The Tekla models were was widely used on mobile devices with the help of Field3D, and so far, it has been shared among 50 users. Attention has been paid to the occupational safety of the units during the design, and the contractor modeled solutions for fall protection. The structural designer modeled the transportation supports of the door openings plus all the other structures needed to support the units of various shapes. The support points for the cranes and elevators for construction work were also modeled. The safety of the lifts was ensured carefully, and the model was utilized as a visual aid. Perhaps the most particular work-time structure modeled is a temporary support for the crane on the 15th floor as requested by the builders. 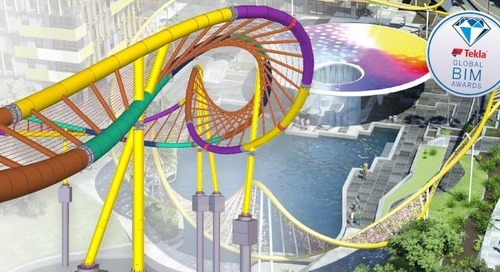 They needed to find out the exact center of gravity of the very complex support in order to design and install it horizontally, safely and accurately. 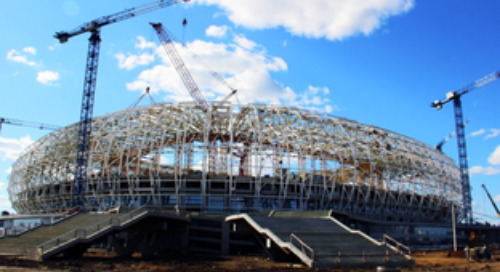 Precast and Steel detailers coordinated structures to ensure flawless connections between different materials.